This took me a while. I did the first three as audiobooks (all hail Davina Porter, bestest narrator ever) but picked up this and the next one when they were discounted for kindle and decided to try actually reading it. I do still enjoy the story, but I love Davina Porter's narration so much that it was in the back of my mind the entire book. This book is a bit weaker and follows the "if you only were honest/talked to each other everything would have been fine" scenario. A lot of the drama would have been solved if people had taken five minutes to put their feelings aside and be honest. But that is the nature of drama and literature. 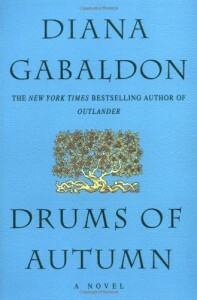 The book picks up shortly after Voyager with Claire and Jamie unexpectedly in the New World trying to make their way and figuring out where to go/settle. The story jumps between them and their daughter Brianna, left behind in the 20th century Boston and figuring out her relationship with the Scot Roger Wakefield who she met in the last book. Roger finds information about her parents, but doesn't tell her. Looking forward to the next one and I will definitely be picking up the audiobook.